At one point in The Kreutzer Sonata, the obsessively mad Pozdnyshev breaches the taboo of chamber music etiquette by invading the space of the violinist and pianist who are in the midst of communicating a rare serene moment in this famous Beethoven work. His stance is almost menacing and he walks away resuming his blistering monologue while the musicians continue to play. It is a jarring moment. Only a madman would dare contemplate such a gesture. In the most intimate setting that chamber music offers, the performers communicate to each other, through subtle visual cues and body movement. Watch closely and they instinctively are syncing their breathing and heart rates. It is an immensely gratifying wonder of nonverbal human communication. And, even to the listener, its hopeful meaning is significant. It is the redeeming opportunity to observe how music’s capacity to communicate purely can be freed from the normal human tendencies which also do allow us to yearn for emotional attachments but often end up instead morphing into uncompromising power plays for dominance, control, humiliation and revenge. In less than 50 minutes, Plan-B Theatre’s production of Eric Samuelsen’s very loose adaptation of the Tolstoy novella by the same name commands at every word, musical note and breath the declaration of excellence. Indeed, a theater company’s opening production for a new season can say a lot about the forthcoming year. 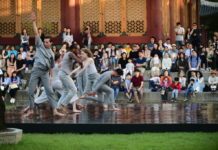 Thus, Plan-B’s 25th season will be a blockbuster, an impressive accomplishment for a group that has a consistently unique knack for leveraging monumental emotional and artistic punches from the deepest interior of minimalism and intimate spaces. 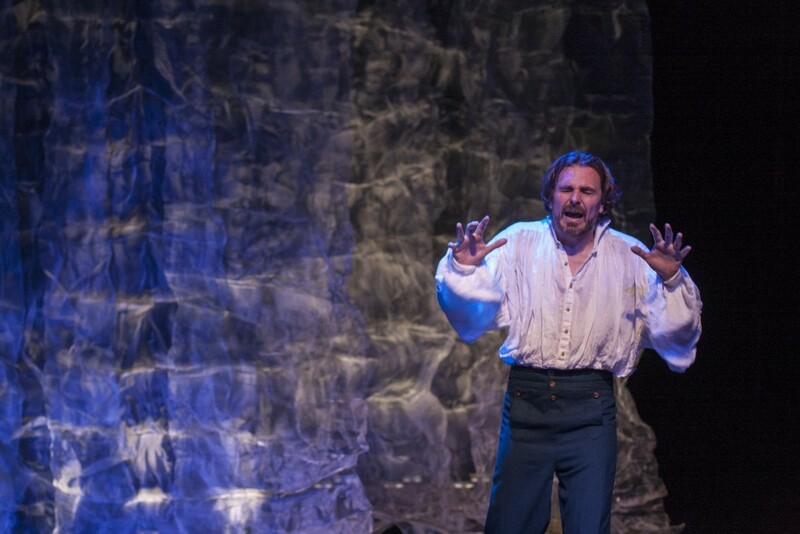 Samuelsen’s play, directed by Jerry Rapier, also offers a compelling creative alternative to other attempts to bring this particular Tolstoy story to the stage, including a recent adaptation that sought to incorporate a live performance of Beethoven’s Kreutzer Sonata in different ways. Irish playwright Nancy Harris penned a 90-minute version but several critics commented the intermittent musical interludes often overwhelmed and diminished the monologue of Pozdnyshev who tries to rationalize murdering his wife, believing that she was having an affair with her musician friend. In Harris’ play, the musicians play behind a scrim and the work starts with the sonata’s middle movement. It is narrative theater set in a railroad car. Meanwhile, Plan-B’s work strikes a balance that goes deeper than exploiting the novelty of two local collaborators bringing their talents into a single production. In his tenth play for Plan-B, Samuelsen’s rendering is slimmer (some 40 minutes shorter than Harris’ treatment) as it parallels the driving pace of Beethoven’s work. He lets Pozdnyshev explain the most candid depths of his madness while drawing the audience inward to ‘watch, learn and listen’ in the way this tormented man might have heard the music. Only the first movement is played in its entirety and, in more than 15 other instances, Samuelsen weaves the music — sometimes no more than a bar or two of music or an extended yet brief segment of one of the sonata’s other two movements — progressively deeper into the monologue, often with Pozdnyshev speaking over the musicians’ phrases. This is music as classic mise en scène — the play’s de facto fourth character. Early on, Pozdnyshev can control what he hears. The violinist plays one chord and is stopped immediately. By late in the play, the music’s presence cannot be contained, reentering the ‘dialogue’ more frequently, as Pozdnyshev desperately tries to make his case. The dashing aristocrat with the steel composure at the beginning becomes a pathetic shouting, disheveled misogynist and misanthrope by the end, when the music from the first movement’s final section returns and floods the stage. Whatever opportunity arises for Pozdnyshev to gain the slightest modicum of sympathy from the audience is dashed by the impenetrable resilience of Beethoven’s music. 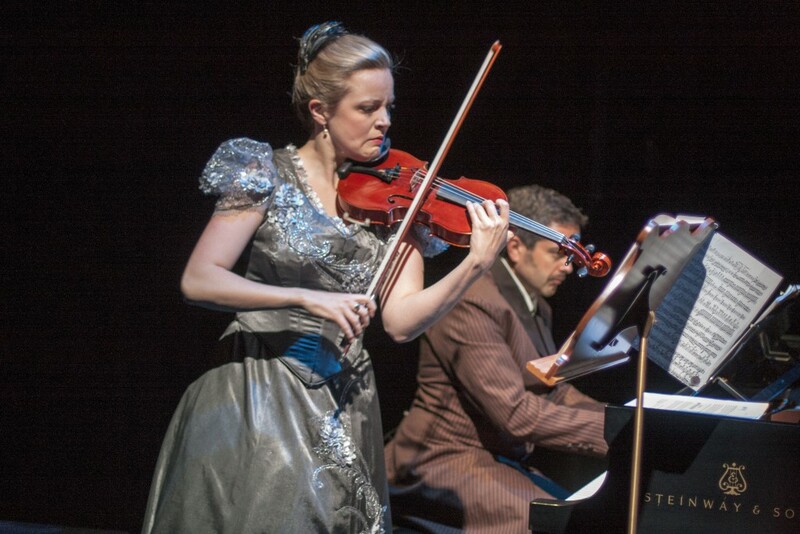 The cast – Pozdnyshev (played with unforgettable credibility by Robert Scott Smith), the violinist and pianist (Kathryn Eberle and Jason Hardink, respectively, from NOVA Chamber Music Series, rising fully to their unorthodox roles as musician-actors) – realizes Samuelsen’s exquisitely orchestrated rendition with maximal impact. At the opening performance, there were a few tense moments of hesitation early for all members settling in this unusual performing territory. 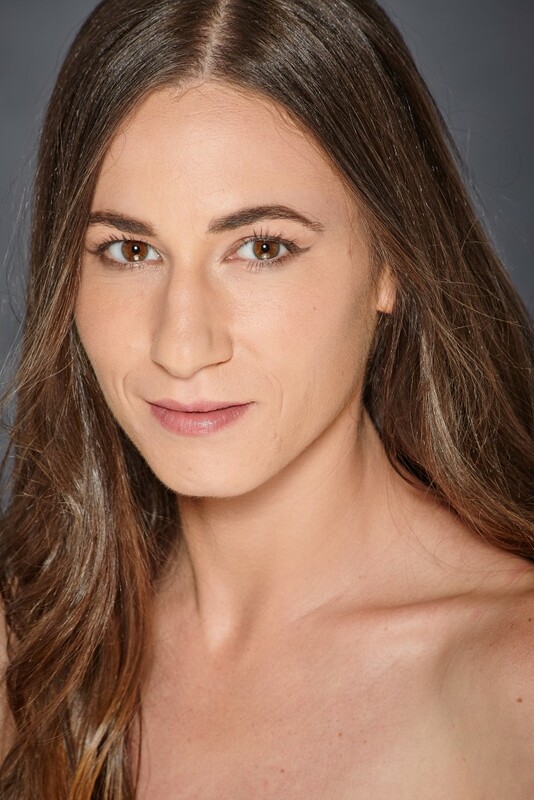 However, all three cast members found their bearings very quickly and the ensemble crackled with intense energy especially in the latter half. The tempi were exhilarating in many spots. Samuelsen may not be a musician but his extensive scholarship and work with the great Scandinavian playwrights such as Ibsen and Strindberg serve him well in crafting his own telling of Tolstoy’s well-known novella (in a post-performance discussion with the audience, Samuelsen says, of the 3,500 words in the script, 70 percent was his; 30 percent, Tolstoy). The 1889 story sounds and feels 2015, as Samuelsen makes clear that our attitudes and double standards about marriage and sexual relations appear as unenlightened as ever. Beethoven’s music was premiered in 1803 — timely as it is timeless. As Eberle mentioned in the post-performance discussion, she likely will approach this particular work in the future with this play in mind. Some carry a naïve romantic ideal that the world of chamber music is a never-ending gloriously artistic Garden of Eden. Audiences watch performances from a safe distance, perhaps glimpsing a sense of the musicians being warm and affectionate to each other, a dynamic certainly bolstered by their common affinities in their musical experience and training. But playing great, physically demanding works such as The Kreutzer Sonata also makes musicians vulnerable because of hard artistic choices, which must be made to achieve that performing magic. Two individually assertive musical voices must give and take in order to establish that balance. Flexibility — not the capacity for withering contempt bordering on outright hatred — is the essential ingredient for achieving that self-confidence and utter sense of physical ease and relaxation in playing chamber music. Eberle and Hardink carry out Samuelsen’s literary intentions without overtaking them or compromising Smith’s own formidable voice as an interpreter. Fatalistic in his frustration, Pozdnyshev can barely abide observing this musical interaction at a distance. As the musicians play the first movement, the man retreats almost to invisibility in the midst of a set that represents his turbulent, irreconcilable state of mind (designed by Randy Rasmussen with lighting by Jesse Portillo). One wonders if Pozdnyshev has ever enjoyed even the simplest enthralling moment of human existence. Has he ever tried to strike the balance? Performances continue until Nov. 9 on Sundays and Mondays at 7 p.m. in the Studio Theatre of the Rose Wagner Center for Performing Arts. 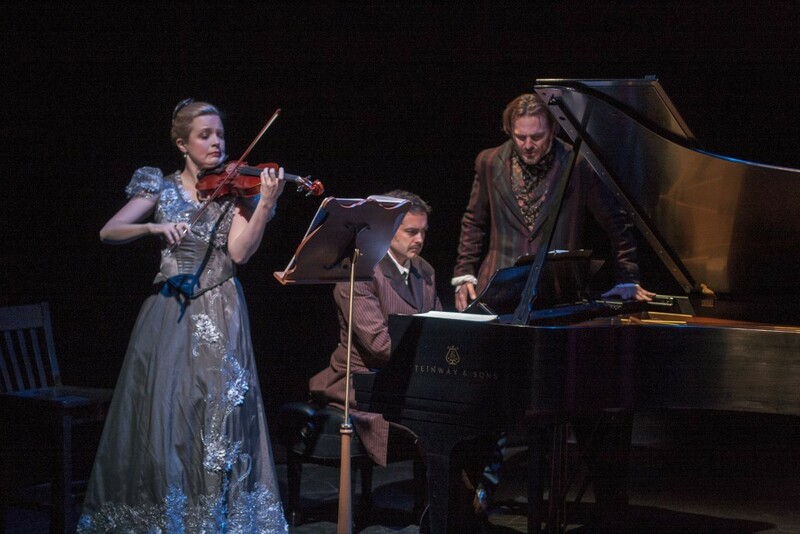 In addition to the Salt Lake City performances, The Kreutzer Sonata will be presented Nov. 4 at 9 p.m. at New York City’s United Solo Theatre Festival. Tickets are going quickly and are now only available for the November performances. Ticket information is here. Recordings featuring Hardink and Eberle on the Beethoven work also are available, see here. NOTE: All photos by Rick Pollock.